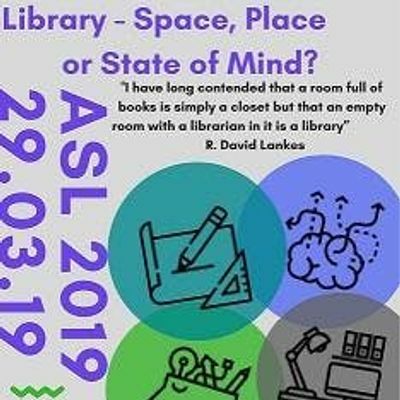 ASL Conference and Exhibition 2019: Library - Space, Place, or State of Mind?" 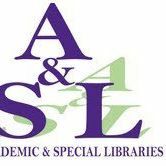 What is a "library"? A physical place? A virtual space? A state of mind? 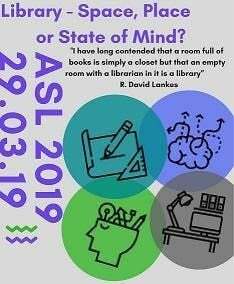 We think we know what a library should look like, what it should contain and how it should work, but does that match with the experiences of our users? Or with the people who work in them? We will hear from libraries, cultural institutions, places of business or commercial spaces who work with culture and information or others who have something to say on this topic. Please be advised that filming and photography might take place at this event and that images and recordings may be used on social media and other platforms. By registering you agree to this. There is little parking in the area. Please use public transport. Buses are running frequently along the quays and on Dame Street. Please visit https://www.transportforireland.ie/ for more information. Please email us at YXNsc2VjdGlvbmV2ZW50cyB8IGdtYWlsICEgY29t. Cancellations: In accordance with our registration policy, refunds will not be issued for cancellations received after 5pm on Wednesday 27th March 2019. Please direct cancellation queries to Eva Hornung at YXNsc2VjdGlvbmV2ZW50cyB8IGdtYWlsICEgY29t. Yes, at any stage. Just log into your account. If you are unable to attend, you may also opt to nominate a substitute - contact details for the substitute attendee should be received no later than 12 noon, Monday 18th March 2019. Please direct cancellation queries to Eva Hornung at YXNsc2VjdGlvbmV2ZW50cyB8IGdtYWlsICEgY29t.